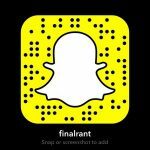 FinalRant is a platform where the modern woman can come to delight in the latest trends in beauty, fashion, hair and whatever else. Think your brand would work well with my blog or Youtube channel? ​I have worked with newer companies looking for brand exposure and product introduction. I also have experience with more established companies like BiteBeauty, Marc Jacobs and Garnier Fructis on campaigns. I enjoy doing giveaways, unboxings and video reviews as well. Click here for my rate sheet!